Having just finished reading Dave Eggers' historical nonfiction book, Zeitoun (2009), which chronicles the lives of the New Orleans Zeitoun family during and after Hurricane Katrina, I find myself returning to the above opening quote of the book, mulling over the myriad ways the people involved in the story, as well as the political and social structures, were guilty of over-reliance on a familiar tool. 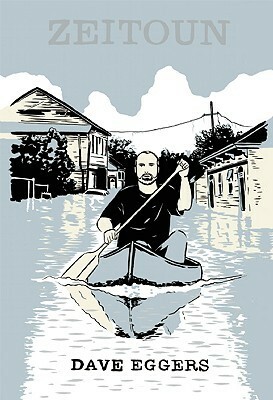 The book tackles many of the U.S.'s social ills, the most transparent being the militarized response to Hurricane Katrina. But the way the Zeitouns' story dovetails with both the war on terror and the wake of Katrina creates a heartrending landscape of a Muslim family caught in this swirling storm of wars, prisons, patriotism and prejudices. This complex and exceedingly efficient government operation was completed while residents of New Orleans were trapped in attics and begging for rescue from rooftops and highway overpasses. The portable toilets were available and working at Camp Greyhound while there were no working bathrooms at the Convention Center and Superdome a few blocks away. Hundreds of cases of water and MREs [meals ready-to-eat] were readily available for the guards and prisoners, while those stranded nearby were fighting for food and water. If you haven't read Zeitoun yet, I highly recommend it not only for the window it provides into an important (and already fading?) moment in U.S. history, but also for Eggers' superb writing. Many social and political problems underlie and propel the story, but the lives these problems affect breathe through Eggers' storytelling ability. I've been wanting to read this book, and you certainly make the case that it will be time well spent. Thanks for the review. Awesome idea for a blog! I like it.